Air conditioners often use a fan to distribute the conditioned air to an occupied space such as a building or a car to improve thermal comfort and indoor air quality. Electric refrigerant-based AC units range from small units that can cool a small bedroom, which can be carried by a single adult, to massive units installed on the roof of office towers that can cool an entire building. The cooling is typically achieved through a refrigeration cycle, but sometimes evaporation or free cooling is used. Air conditioning systems can also be made based on desiccants (chemicals which remove moisture from the air). Some AC systems reject or store heat in subterranean pipes. In the most general sense, air conditioning can refer to any form of technology that modifies the condition of air (heating, (de-) humidification, cooling, cleaning, ventilation, or air movement). In common usage, though, "air conditioning" refers to systems which cool air. In construction, a complete system of heating, ventilation, and air conditioning is referred to as HVAC. The basic concept behind air conditioning is said to have been applied in ancient Egypt, where reeds were hung in windows and were moistened with trickling water. The evaporation of water cooled the air blowing through the window. This process also made the air more humid, which can be beneficial in a dry desert climate. Other techniques in medieval Persia involved the use of cisterns and wind towers to cool buildings during the hot season. 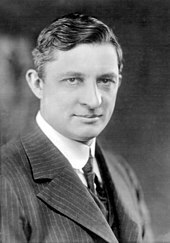 Modern air conditioning emerged from advances in chemistry during the 19th century, and the first large-scale electrical air conditioning was invented and used in 1902 by US inventor Willis Carrier. The introduction of residential air conditioning in the 1920s helped enable the great migration to the Sun Belt in the United States. Shortly thereafter, the first private home to have air conditioning was built in Minneapolis in 1914, owned by Charles Gates. Realizing that air conditioning would one day be a standard feature of private homes, particularly in regions with warmer climate, David St. Pierre DuBose (1898-1994) designed a network of ductwork and vents for his home Meadowmont, all disguised behind intricate and attractive Georgian-style open moldings.[when?] This building is believed to be one of the first private homes in the United States equipped for central air conditioning. Dichlorodifluoromethane (R-12) was the most common blend used in automobiles in the U.S. until 1994, when most designs changed to R-134A due to the ozone-depleting potential of R-12. R-11 and R-12 are no longer manufactured in the U.S. for this type of application, but is still imported and can be purchased and used by certified HVAC technicians. For systems requiring only an occasional "shot" of R-12 and otherwise in good working order and performing far better than virtually all "R-134a" systems whether "converted" or "factory", even $50-$100 per pound of R-12 is considered "cheap" by many individuals. Capillary expansion valve connection to evaporator inlet. Notice frost formation. Cooling in traditional AC systems is accomplished using the vapor-compression cycle, which uses the forced circulation and phase change of a refrigerant between gas and liquid to transfer heat. 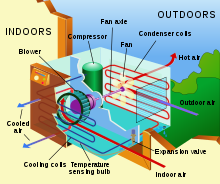 The vapor-compression cycle can occur within a unitary, or packaged piece of equipment; or within a chiller that is connected to terminal cooling equipment (such as a variable refrigerant flow terminal or fan coil unit) on its evaporator side and heat rejection equipment on its condenser side. Since humans perspire to provide natural cooling by the evaporation of perspiration from the skin, reducing relative humidity can promote occupant comfort. An air conditioner designed for an occupied space typically will create a 30% to 60% relative humidity in the occupied space to balance comfort, microbial growth, and other indoor air quality factors. Most modern air-conditioning systems feature a dehumidification cycle during which the compressor runs while the fan is slowed as much as possible to reduce the evaporator temperature and therefore condense more water. When the temperature falls below a threshold, both the fan and compressor are shut off to mitigate further temperature drops;[clarification needed] this prevents moisture on the evaporator from being blown back into the room. When the temperature rises again,[clarification needed] the compressor restarts and the fan returns to low speed. Inverter air conditioners use the inside coil temperature sensor to keep the evaporator as cold as possible. When the evaporator is too cold,[clarification needed] the compressor is slowed or stopped with the indoor fan running. A multi-split system is a conventional split system, which is divided into two parts (evaporator and condenser) and allows cooling or heating of several rooms with one external unit. In the outdoor unit of this air conditioner there is a more powerful compressor, ports for connecting several traces and automation with locking valves for regulating the volume of refrigerant supplied to the indoor units located in the room. Central ducted A/C provides temperature control and ventilation to an area by conditioning air within an air handler and distributing it to one or more zones. The temperature of individual zones can be controlled by varying the airflow to each zone and/or reheating the air. A portable system has an indoor unit on wheels connected to an outdoor unit via flexible pipes, similar to a permanently fixed installed unit.The portable units draw indoor air and expel it outdoors through a single duct. 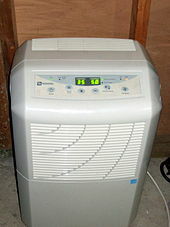 Many portable air conditioners come with heat as well as dehumidification function. Air conditioning is common in the US, with 88% of new single-family homes constructed in 2011 including air conditioning, ranging from 99% in the South to 62% in the West. In Canada, air conditioning use varies by province. In 2013, 55% of Canadian households reported having an air conditioner, with high use in Manitoba (80%), Ontario (78%), Saskatchewan (67%), and Quebec (54%) and lower use in Prince Edward Island (23%), British Columbia (21%), and Newfoundland and Labrador (9%). In Europe, home air conditioning is generally less common. Southern European countries such as Greece have seen a wide proliferation of home air-conditioning units in recent years. In another southern European country, Malta, it is estimated that around 55% of households have an air conditioner installed. Poorly maintained water cooling towers can promote the growth and spread of microorganisms such as Legionella pneumophila, the infectious agent responsible for Legionnaires' disease. As long as the cooling tower is kept clean (usually by means of a chlorine treatment), these health hazards can be avoided or reduced. The state of New York has codified requirements for registration, maintenance, and testing of cooling towers to protect against Legionella. Production of the electricity used to operate air conditioners has an environmental impact, including the release of greenhouse gases. According to a 2015 government survey, 87% of the homes in the United States use air conditioning and 65% of those homes have central air conditioning. Most of the homes with central air conditioning have programmable thermostats, but approximately two-thirds of the homes with central air do not use this feature to make their homes more energy efficient. ^ "air con Definition in the Cambridge English Dictionary". dictionary.cambridge.org. Retrieved 1 March 2018. ^ Darling, David. "Earth cooling tube". daviddarling.info. Retrieved 1 March 2018. ^ McDowall, Robert (2006). Fundamentals of HVAC Systems. Elsevier. p. 3. ISBN 9780080552330. ^ Nagengast, Bernard (February 1999). "A History of Comfort Cooling Using Ice" (PDF). ASHRAE Journal: 49. Archived from the original (PDF) on 2013-08-12. Retrieved 22 July 2013. ^ Bahadori MN (February 1978). "Passive Cooling Systems in Iranian Architecture". Scientific American. 238 (2): 144–154. doi:10.1038/scientificamerican0278-144. ^ Needham, Joseph (1991). Science and Civilisation in China, Volume 4: Physics and Physical Technology, Part 2, Mechanical Engineering. Cambridge University Press. pp. 99, 151, 233. ISBN 978-0-521-05803-2. ^ Needham, Joseph (1991). Science and Civilisation in China, Volume 4: Physics and Physical Technology, Part 2, Mechanical Engineering. Cambridge University Press. pp. 134, 151. ISBN 978-0-521-05803-2. ^ Laszlo, Pierre (2001). Salt: Grain of Life. Comumbia University Press. ISBN 9780231121989. ^ Franklin, Benjamin (June 17, 1758). "Letter to John Lining". Retrieved 6 August 2014. ^ "A Brief History of Air Conditioning". Popular Mechanics. January 2015. Retrieved 2015-01-01. ^ "Early University Benefactors" (PDF). Rizzoconferencecenter.com. Retrieved 2012-11-08. ^ "Unsung Engineering Heros: Robert Sherman". Navlog.org. Retrieved 2015-06-10. ^ "Air Conditioners & Dehumidifiers". Sylvane. July 2011. ^ Mate, John "Making a Difference: A Case Study of the Greenpeace Ozone Campaign" RECIEL 10:2 2001. ^ Benedick, Richard Elliot Ozone Diplomacy Cambridge, MA: Harvard University 1991. ^ a b "Happy birthday, Greenfreeze!". Greenpeace. Retrieved 8 June 2015. ^ a b "Ozone Secretariat". United Nations Environment Programme. Archived from the original on 12 April 2015. Retrieved 8 June 2015. ^ "La Historia del "Greenfreeze"". Ilustrados.com. Retrieved 2015-06-10. ^ a b "Discurso de Frank Guggenheim no lançamento do Greenfreeze | Brasil". Greenpeace.org. Retrieved 2015-06-10. ^ a b c "Greenfreeze: a Revolution in Domestic Refrigeration". www.ecomall.com. Retrieved 8 June 2015. ^ "Der Greenfreeze - endlich in den USA angekommen" (in German). Greenpeace.de. 2011-12-28. Retrieved 2015-06-10. ^ "PepsiCo Brings First Climate-Friendly Vending Machines to the U.S." phx.corporate-ir.net. Retrieved 8 June 2015. ^ "Climate-Friendly Greenfreezers Come to the United States". WNBC. Retrieved 8 June 2015. ^ a b "Significant New Alternatives Program: Substitutes in Household Refrigerators and Freezers". Epa.gov. 2014-11-13. Retrieved June 4, 2018. ^ Shane Smith (2000). Greenhouse gardener's companion: growing food and flowers in your greenhouse or sunspace (2nd ed.). Fulcrum Publishing. p. 62. ISBN 978-1-55591-450-9. ^ Snijders, Aart (2008). "ATES Technology Development and Major Applications in Europe" (PDF). Conservation for the Living Community Workshop (Toronto and Region Conservation Authority. IFTech International. Retrieved 1 March 2018. ^ [www.dristeem-media.com/literature/Web_HumidityAndComfort.pdf "Dristeem: Humidity and Comfort"] Check |url= value (help) (PDF). Retrieved 25 March 2019. ^ Kreider, Jan F., ed. (2001). Handbook of heating, ventilation, and air conditioning. CRC Press. ISBN 978-0-8493-9584-0. ^ Winnick, J (1996). Chemical engineering thermodynamics. John Wiley and Sons. ISBN 978-0-471-05590-7. ^ "NIST Guide to the SI". National Institute of Standards and Technology. Archived from the original on 28 May 2007. Retrieved 2007-05-18. ^ "Energy Glossary – S". Energy Glossary. Energy Information Administration. Retrieved 2006-07-02. ^ SEER conversion formulas from Pacific Gas and Electric. Web.archive.org (2007-12-02). Retrieved on 2012-01-09. ^ Staff, Writer (2016-01-13). "Timeline: Bright ideas". The Boston Globe. Retrieved 2017-04-17. ^ "PTAC Buying Guide". Sylvane. ^ Hearst Magazines (June 1935). Popular Mechanics. Hearst Magazines. pp. 885–. ISSN 0032-4558. Retrieved 9 January 2012. ^ "Mitsubishi Contractors Guide" (PDF). Mitsubishipro.com. p. 16. Archived from the original (PDF) on 2015-02-26. Retrieved 2015-06-10. ^ "Mitsubishi Electric US, Inc. Cooling & Heating | HVAC". Mitsubishipro.com. 2010-02-17. Archived from the original on 2015-06-03. Retrieved 2015-06-10. ^ "Ductless Mini-Split Air Conditioners". US Department of Energy. 2012-08-09. Retrieved 2013-06-14. ^ "Ductless, mini-Split Heat Pumps". US Department of Energy. Retrieved 2013-06-19. ^ Trott, A. R.; Welch, T (2000). Refrigeration and Air-Conditioning. Great Britain: Reed Educational and Professional Publishing Ltd. p. 312. ISBN 0 7506 4219 X. ^ "In the two hose design the exchanged air does not come from the interior of the room or house, but enters through the second hose". Experts123.com. Retrieved 2015-06-10. ^ "Qatar promises air-conditioned World Cup". CNN. 2010-12-03. ^ "BBC World Service - News - Qatar 2022: How to build comfortable stadiums in a hot climate". Bbc.co.uk. 2010-12-03. Retrieved 2012-11-08. ^ a b Kingma, Boris; van Marken Lichtenbelt, Wouter (3 August 2015). "Energy consumption in buildings and female thermal demand". Nature Climate Change. 5 (12): 1054. doi:10.1038/NCLIMATE2741. ^ Lang, Susan (October 19, 2004). "Study links warm offices to fewer typing errors and higher productivity". Cornell Chronicle. Retrieved 25 September 2015. ^ "Statistics Canada - Households and the Environment Survey, 2013". The Daily - Households and the Environment Survey, 2013. Statistics Canada. 2015-03-10. Retrieved 2015-05-11. ^ "Χρυσές" δουλειές για τις εταιρείες κλιματιστικών έφερε το κύμα καύσωνα (in Greek). Athens: Lambrakis Press. 2007-07-25. Retrieved 2008-06-30. ^ "STĦARRIĠ DWAR ID-DĦUL U L-INFIQ TAL-FAMILJA 2008 /HOUSEHOLD BUDGETARY SURVEY 2008" (PDF). National Statistics Office, Maltz. Retrieved 2011-07-14. ^ "Protection Against Legionella". www.health.ny.gov. Retrieved 25 March 2019. ^ "One in eight U.S. homes uses a programmed thermostat with a central air conditioning unit". U.S. Energy Information Administration. U.S. Department of Energy. 2017-07-19. Retrieved 2017-07-20. ^ Leon Neyfakh (21 July 2013). "How to live without air conditioning". The Boston Globe. ^ "Impact of Vehicle Air-Conditioning on Fuel Economy" (PDF). National Renewable Energy Laboratory. Retrieved 6 February 2012. ^ "Refrigerant Management Program Refrigerants Regulated". Californial Environmental Protection Agency. Archived from the original on 4 October 2013. Retrieved 22 April 2014. ^ "CHEMICALS IN THE ENVIRONMENT: FREON 113 (CAS NO. 76-13-1) : prepared by OFFICE OF POLLUTION PREVENTION AND TOXICS, U.S. ENVIRONMENTAL PROTECTION AGENCY" (TXT). Epa.gov. August 1994. Retrieved 2015-06-10. ^ "Chapter.2_FINAL.indd" (PDF). Retrieved 2010-08-09. ^ "2010 to 2015 government policy: environmental quality". GOV.UK. 2015-05-08. Retrieved 2015-06-10. ^ Schlossberg, Tatiana (August 9, 2016). "How Bad Is Your Air-Conditioner for the Planet?". NYT. Retrieved August 17, 2016. ^ "Complying With The Section 608 Refrigerant Recycling Rule | Ozone Layer Protection - Regulatory Programs | US EPA". Epa.gov. 2015-04-21. Retrieved 2015-06-10. ^ "The current status in Air Conditioning – papers & presentations". R744.com. Archived from the original on 2008-05-14. Retrieved 2010-08-09. ^ "Greenfreeze F-Gas Victory! Greener Refrigerators Finally Legal in the U.S." Greenpeace.org. Archived from the original on 2015-06-12. Retrieved 2015-06-10. This page was last edited on 19 April 2019, at 18:20 (UTC).